This recipe has been a long time coming…. 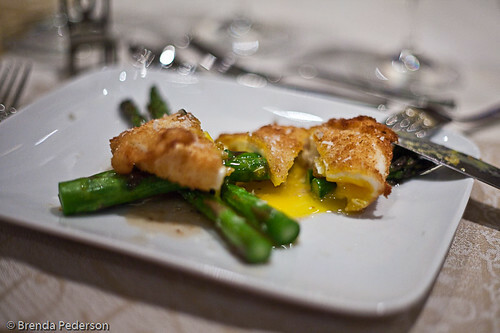 It was more than three years ago when I first made Grilled Asparagus Salad with Sherry Vinaigrette and a Crispy Egg and I’m finally getting around to writing about it. Araxi is one of my favorite restaurants in Whistler Village. I always stop in at least for a bite of something at the bar, if not for a full dinner. When some friends visited Whistler several years ago I recommended Araxi as a place they had to visit. They had a wonderful meal and also became fans. When the Araxi cookbook was released in 2009 they decided to host a dinner where we’d all make something from the cookbook. Six of us got together in May 2010 and this is the dish I made. I loved this recipe from the beginning but must have held off posting it because there are several steps, so the instructions are long. Luckily for me, procrastination has paid off. A year or so after the dinner with my friends, James Walt, the Araxi chef who wrote the cookbook, appeared on a local program and they posted this recipe online. Can you say cut and paste? This recipe is listed as a dinner starter in the cookbook, but would also make a nice brunch or lunch main course. When I made this dish I was very concerned about handling and deep-frying the poached eggs but found that they are actually pretty tough when they’ve cooled. I didn’t have any trouble breading or frying them. I would, however, recommend poaching a couple extra, “just in case” for your peace of mind, but there’s a very good chance you won’t need your extras. In a small bowl, whisk together the grainy mustard and the sherry vinegar until well combined. Slowly add the grapeseed oil in a thin stream, whisking continuously until the vinaigrette emulsifies. Season with salt and pepper. Will keep refrigerated in an airtight container for up to 5 days. Preheat a grill or barbecue to high heat. Fill a large bowl with ice water. Bring a large saucepan of salted water to a boil on high heat. Add the asparagus and blanch for 1 minute. Remove the asparagus and plunge them into the ice water to stop the cooking, then arrange them on a tea towel to dry. In a large shallow bowl, gently toss the asparagus and the olive oil, then sprinkle liberally with salt. Grill the asparagus for 1 to 2 minutes per side, or until lightly charred. Remove from the grill (or barbecue) and keep warm or at room temperature. Fill a large bowl with ice water. In a medium saucepan on high heat, heat 12 cups/3 L of water. Add the white vinegar and a pinch of salt and bring to a boil. Reduce the heat to low, or until the water is just simmering. Crack 4 eggs into individual ramekins or coffee cups. Swirl the water with a large spoon, then, one at a time, quickly pour the eggs into the water. Poach each egg for 3-4 minutes. Using a slotted spoon, transfer the eggs to the ice water to stop the cooking. Once the eggs are cool, trim any ragged edges so the whites form nice rounds. Carefully place the eggs on a tea towel and gently blot them dry. Note: the eggs can be poached ahead of time and kept in the refrigerator until you are ready to proceed. Remove the eggs from the refrigerator 30 minutes to an hour before continuing so that they will heat properly when fried. Fill a deep pot or a wok to two-thirds full with peanut (or vegetable) oil and heat it to 330°f/165°c (use a deep-fat thermometer to check the temperature). In a small bowl, whisk the remaining 2 eggs with the milk. Combine the flour and a pinch of salt in a second bowl and the bread crumbs and Parmesan cheese in a third bowl. One at a time, carefully dredge the poached eggs in the seasoned flour, then dip them in the beaten egg mixture and coat them with the bread crumb mixture. Deep-fry the eggs for 1 minute until golden brown (the eggs will still be runny inside), then use a slotted spoon to transfer the eggs to a paper towel to drain. Lightly season with salt. 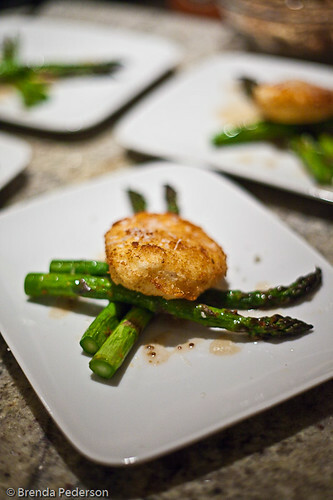 Arrange 6 spears of asparagus on each plate, then drizzle with the vinaigrette. Top each serving with a crispy egg and serve immediately. Note: If you look at the photos you’ll notice I only used 4 spears per plate. Since this was a starter I wanted to keep the portions a little smaller. It’s a beautiful cookbook and this recipe was one that was correct; unfortunately whoever tested the recipes must have been smokin’ crack. Several of them are wrong and do not work if you follow them as written. If you’re an experienced cook your gut will tell you when something is off. If you read the recipes with a little skepticism and rely on your instincts, you’ll most likely be okay. I don’t recommend the cookbook for new cooks, though. There are just too many errors.